Because of the heavy lifting the job demands, Raub sees a local trainer to help keep his spine healthy for further physical endeavors. 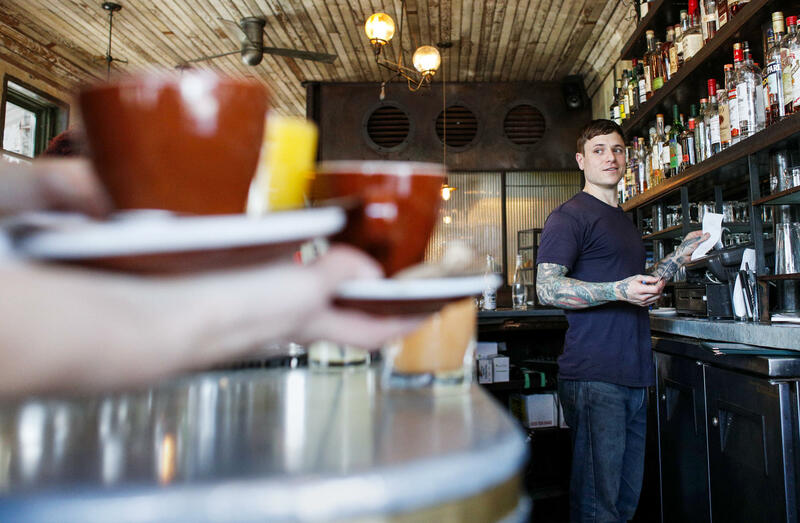 Casey Raub is a bartender at a busy brunch spot in Brooklyn, New York City. After injuring himself in an accident, he found that his work, like hoisting heavy buckets of ice, compounded his lower back pain. Dy Elise has Casey Raub come in for a couple of low-intensity, 20-to-30-minute sessions a week to strengthen the areas that are fatigued through bartending, like his lower back. Bartender Casey Raub says that after a few weeks of low-intensity strength training with Dy Elise, he had conditioned his back and core. Elise owns a Brooklyn wellness center called Human@Ease and treats many of the borough's bartenders, servers and chefs. Weight-resistant strength training isn't the only method restaurant workers seek to curb their pain. Yoga, pilates and acupuncture are also popular options. Casey Raub can easily deadlift over 100 pounds — not thanks to the gym, but from his work as a bartender at ever-packed Brooklyn brunch hotspot Five Leaves. Raub, 35, regularly hoists heavy boxes of liquor and massive buckets of ice for an endless stream of gin gimlets and grapefruit margaritas. 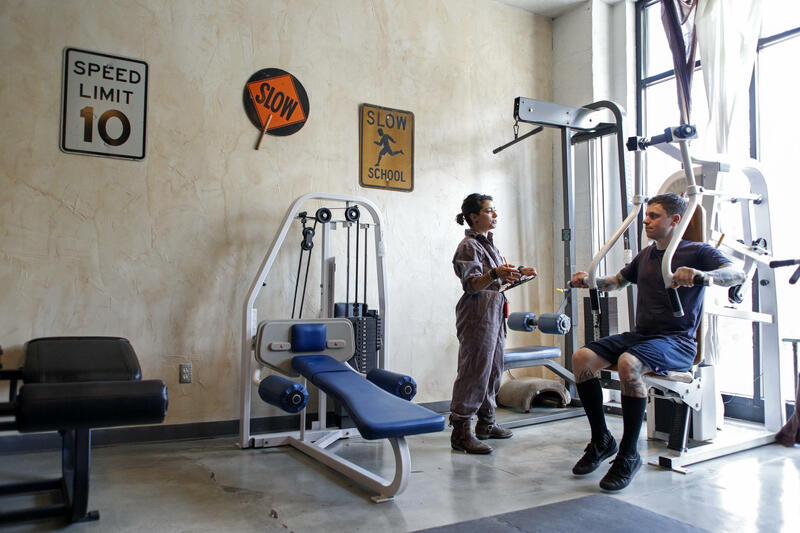 Two and a half years ago, he was injured in a cycling accident, and his work routine only compounded his back pain. While pouring a coffee for a customer named Dy Elise, he mentioned his chronic pain to her. Elise, owner of a nearby wellness center called Human@Ease, encouraged him to come in for a rehabilitative workout focusing on his back. "One of the most important things for restaurant workers is to do lower-back exercises, because the lower back is constantly working to stabilize you," Elise says. 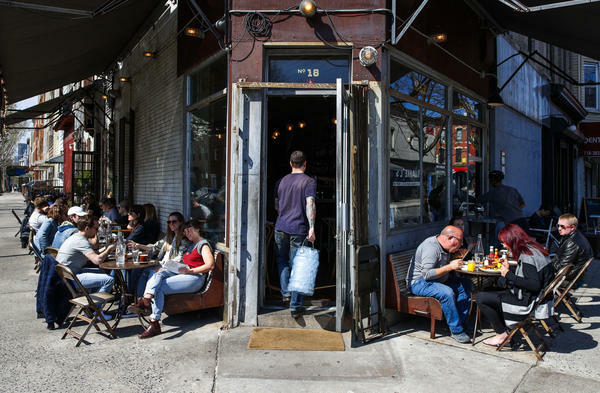 Raub began working out on low-intensity machines with Elise, who treats many of the borough's bartenders, servers and chefs. Within weeks, they had strengthened his back and core so he could continue bringing home a mostly painless paycheck. "I've had positive gains in building muscle mass in just a couple low-intensity, 20-to-30-minute sessions a week, and improvements in the areas that are fatigued through bartending, like my lower back," Raub says. "People can do this job for a while, but I think for people in my age group of mid-to-late 30s, it's taxing and you need to find a way to be healthy long-term — or you need to get out." The average leisure and hospitality employee stays at one job for only 2.2 years. With hazardous working conditions and low rates of health benefits, high levels of attrition are hardly surprising. With a chef shortage, attrition is costly and retention is vital for the restaurant industry. Chefs may love cooking, servers may have a passion for hospitality, and bartenders may excel at making drinks, but a harsh working environment may knock some would-be long-termers out of the game early. Several national organizations have been established recently to help restaurant workers cope with and stay in the game. For instance, there's Chefs With Issues, which hones in on anxiety, depression and addiction. Restaurant Recovery focuses solely on addiction. Journee works with the industry at large, providing discussion groups, mentorship suppers and networking conferences for a wide variety of restaurant employees. Mind Body Spirit(s) helps bartenders deal with burnout — it offers seminars addressing health initiatives and community outreach, like yoga retreats. Yoga and pilates in particular have found a rapt audience in the restaurant world because of their ability to relax the body and help practitioners manage emotional stress. Emily Branden, who teaches yoga at Mind Body Spirits' annual seminar in Santa Fe, N.M., sees "the dudes who are all tatted up and working in all the great dive bars" actively participating in the new Champagne Yoga brunches she hosts with a chef. "They are taking to it — really listening and learning the concept of meditation," Branden says. "We do yoga and then drink champagne, and I teach simple restorative poses, such as lying down on the floor when they get home at night and putting their legs up on the couch to reverse the blood flow to the legs, so they can sleep better. They learn breath work to deal with the chaotic world at work." 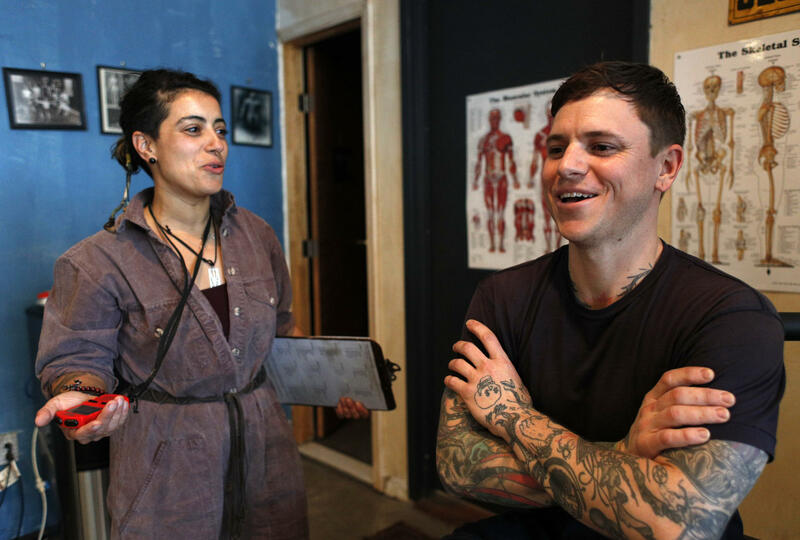 For years, Raub, the bartender, assiduously visited Worksong, a sliding-scale, community-based acupuncture practice in Greenpoint, Brooklyn. Owner Isobeau Trybula says she's seeing an increase in hospitality-industry workers among her clients. "I often get a person who's maybe 23, who took Adderall for four or five years to get them through a very prestigious college, and they now live with four or five people and work in the service industry," Trybula says. "But there is a wall you hit at around 27. " Trybula treats service-industry workers for a variety of ailments, from plantar fasciitis from all-day standing and carpal tunnel from shaking cocktails, to sleep disorders from pounding coffee to stay awake for late-night shifts. In 2008, during the Great Recession, Trybula says she saw a spike in stressed-out clients, with more underemployed and uninsured every year. She believes restaurant owners are asking for more work from their employees than ever, with "people waiting behind you to do your job." Trybula wants young, vulnerable food service workers to focus more on long-term wellness in anticipation of lengthy careers. The irony is that many of the people who make and serve food and drink have pretty erratic eating habits of their own. Think a quickly-shoveled meal before going to work, followed by a grueling 7-to-10-hour shift (with bites of bread snuck in), and band-aided by a drink with coworkers afterward to nurse exhaustion and depression. All that might be capped off at midnight with a bowl of instant ramen at home before passing out. Others subsist merely on coffee, cigarettes and alcohol. They then repeat the process the next day, potentially over a double shift. Nutritionist Christy Harrison works with restaurant industry workers to help them make better daily food choices for long-term health. "Our focus is often to help them carve out time during their shifts to eat their own meals and snacks, and to be aware of their own energy levels and hunger/thirst as they're working, since a busy shift can cause people to completely tune out of their own physical needs," Harrison says. San Francisco server Michael Procopio has been in the industry for 26 years. He knew he needed to quit his unhealthy habits when, already afflicted with depression, he rapidly suffered appendicitis, followed by a heart attack and then the death of his mother later that year. So he cut out his post-shift drink (which he called "self-medicating"), dropped smoking on doctor's orders, lessened his shifts and joined the gym. "I'd never given it much thought before, connections of my own wellness and waiting tables, but the restaurant lifestyle wasn't helpful for my heart, with its late hours," Procopio says. "I've had those concerns and fears of doing this when I'm 60, and I don't know if my body can handle doing it." One of his biggest preventives is psychotherapy. "I don't take the bad stuff home anymore, and part of that is therapy," he says." But his insurance does not cover mental therapy. While the rise of businesses catering to the long-term wellness of workers is welcome, restaurant worker advocate organizations like ROC-United says that broader industry changes like a livable wage, employer-sponsored insurance and sick days are needed in order to create a thriving, long-term industry. While waiting for the industry to catch up, Trybula begs restaurant workers to prioritize their own health. "People say, 'I have a hard time waking up early.' I totally get it, I really do. That's a huge reason we're open until 9 p.m. Making a routine for self-care makes everything better." 02/20/14 - 1:30 -Syndicated food columnist Linda Gassenheimer, Special wine correspondent Fred Tasker and WLRN hosts Joseph Cooper and Bonnie Berman interview Mike Hampton Dean of the Chaplin School of Hospitality at FIU. Hospitality is an important part of our economy and FIU is on the forefront of new ideas and training for the industry. A Miami-based rapper. A second-tier English soccer club and a sports car racing team. What ties them together is Visit Florida, the state group that markets Florida to tourists across the country and across the globe. What also ties these three together is they provided the ammunition for opponents of using taxpayer money to promote tourism. In July 2012, a science reporter for The Washington Post, Brian Vastag, was in Wisconsin visiting his family when a high fever hit. 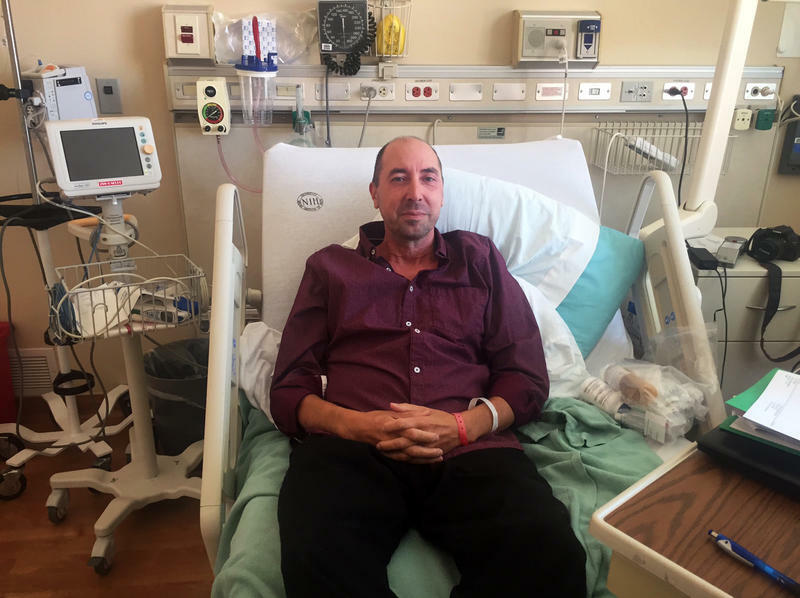 He became instantly bedridden with flu-like symptoms that never went away. "It didn't feel like anything I'd ever had before. ... The things that distinguished it were the dizziness and the feeling of unreality in the head," Vastag says.